The insides of your teeth are composed of a delicate, hypersensitive network of blood, cells, nerves, and tissue known as dental pulp. The treatment of dental pulp and root tissues is called Endodontics. When your teeth become injured or damaged, dental pulp can be invaded by bacteria and become infected -- which is extremely painful to endure. Abscesses that form beneath a tooth can also affect the dental pulp. 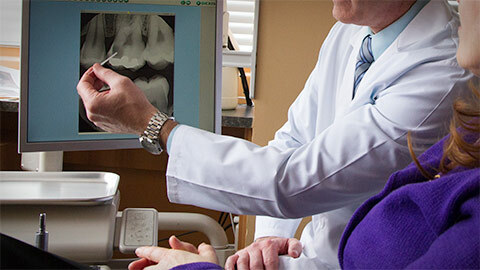 Endodontic therapy -- also known as a root canal -- is a procedure in which your dentist will remove the infected pulp. It is a procedure that is generally done under a local anesthetic that numbs your teeth, gums, tongue and skin around the affected areas. Once the infected pulp has been extracted, a permanent filling -- composed of restorative dental materials -- is used to fill the cavity. Crowns may also be used to treat the tooth. Endodontic therapy is effective in relieving toothache, treating infection, and promoting the healing of your teeth. Although a root canal may sound daunting, our highly-trained team of dentists and assistants will be with you every step of the way -- making it a quick and painless procedure. If you need more information about Endodontics in Mount Pleasant, contact us today.